The UK's biggest choice of motorcycle parts for Japanese and European machines. Many models available in either road-use with removable baffle, or racing-only with even more weight saving features. Choice of reinforced carbon, steel or titanium across many models. 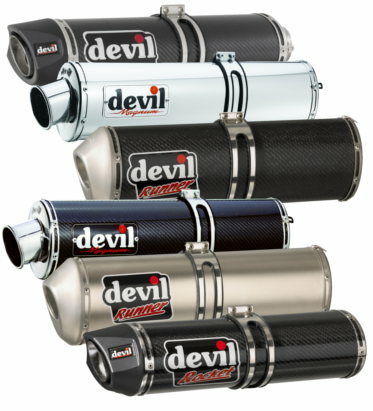 Range of DEVIL silencers of different sizes and styles, whether for classic or ultramodern look. Weight saving of 30-50% compared to OEM. Increase in horsepower: power you can feel at the throttle, not just a few extra at top speeds. Prescision made to increase performance at stock settings: no need to mod the bike, though you'll get even more out of your DEVIL if you do. Spares available across the range. DEVIL's full racing systems are available in titanium for the maximum weight saving, with choice of titanium or carbon silencer. The 6 days enduro range is available in stainless steel only for maximum stability. A performance exhaust isn't complete unless it sounds the part and DEVIL doesn't disappoint; a DEVIL without a baffle has a delightful deep rumbling roar. Homologated DEVIL exhausts and silencers come with a removable baffle and a range of different baffles are available if you want to change your sound but restrict the volume. DEVIL isn't just for the track: DEVIL run on the road with a range of homologated exhausts and silencers which come with a removable baffle. 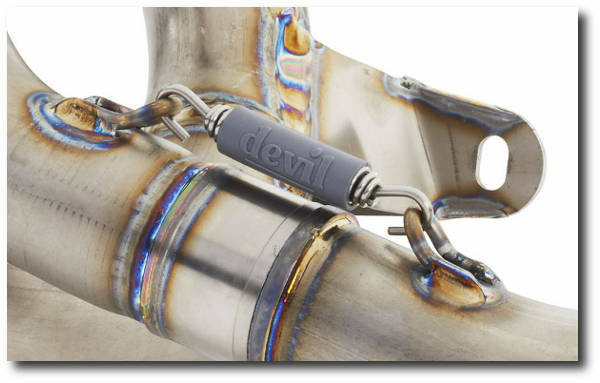 All road-use, e-marked, DEVIL exhausts come with one years manufacturer's warranty.